I’ve been getting quite a lot of calls and emails lately asking about ammunition purchases by the Department of Homeland Security (DHS), the Social Security Administration (SSA), and other federal agencies. I’ve been answering these individual questions, and I wanted to share that answer with all my readers, since it’s clear that this is an important subject in West Texas. 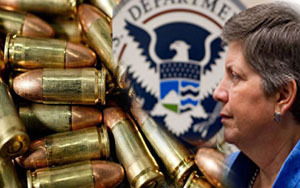 There have been reports about DHS and SSA purchasing quantities of ammunition recently, which has caused concern for some people—why are they buying so many rounds? I’ve looked into this issue, and I want to assure you that the ammunition is only being purchased so these agencies can do their jobs. For instance, DHS oversees Customs and Border Protection, and those officers need ammunition to help keep our border safe and secure. At first glance, it seems odd that the Social Security Administration requires ammunition, but it’s actually used for special agents and criminal investigators that work to prevent Social Security fraud. There are 295 SSA officers that issue warrants and make arrests to prevent people from defrauding our Social Security funds. There’s also a report that the National Weather Service was purchasing ammunition. That ammo was actually meant for the National Oceanic and Atmospheric Administration’s Fisheries Office of Law Enforcement. These officers work to protect fish populations, marine mammals, and commercial fisheries. Like any other law enforcement officers, they are armed for encounters with criminals. The National Rifle Agency (NRA) also investigated these claims and wrote a great explanation, which I encourage you to read. When you take into account training, qualification tests, and on-duty use by each agent, it’s clear that the ammunition purchases are reasonable. Please keep sharing your concerns so I can make sure I’m looking out for your interests in Washington.